how to upload the xml file to add POI? i want to use put api and http authentication. api url http://api06.dev.openstreetmap.org/api/0.6/changeset/create. Can anyone help me to provide c# code for uploading xml file. 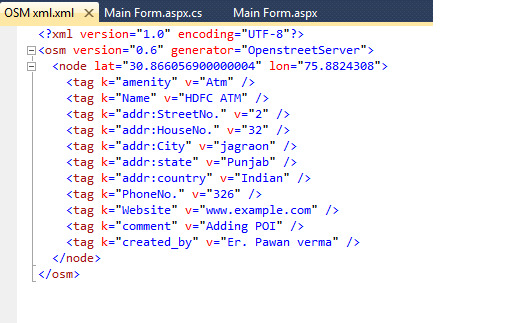 xml looks like attached image. Why exactly do you want to use the OSM API directly for uploading changesets instead of using an editor? Your XML document contains lots of errors. For example Name should be name (lowercase), the same applies to website and your addr: tags. Also, PhoneNo. is wrong and should be phone or contact:phone instead. The tags comment and created_by should be attached to the changeset, not to the element! If you are doing this because you are writing a software that helps people "manage their online visibility" (i.e. some kind of SEO stuff) then please stop right now and don't pursue this further - we have had enough problems with people mass-adding data of questionable value. Among these problems were bad tagging, no respect for already existing data, geocoding from incompatible licenses, and lack of communication (i.e. users adding this data were unwilling or unable to reply when contacted about their edits). If you are planning any kind of automated data import, you will also be expected to respect our import guidelines as explained here http://wiki.openstreetmap.org/wiki/Import/Guidelines which include, among other things, a requirement of discussing things before importing. Your XML example contains a number of tagging errors that would make the data useless in OpenStreetMap. If you were to upload this, it would likely be removed again, and if you were to upload several items like that, your account would be blocked for violation of import policies. i am making a academic project. i will just use the testing api.